War! Yeah! Huh! What is it good for? … killing some time when you’ve got a pack of cards and an opponent. 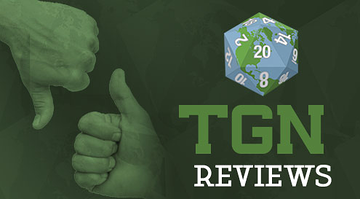 Everyone knows the age-old game of “high card wins.” But what if you want something a bit less “just random-shuffling determined?” That’s what the guys over at Foursight Games thought. 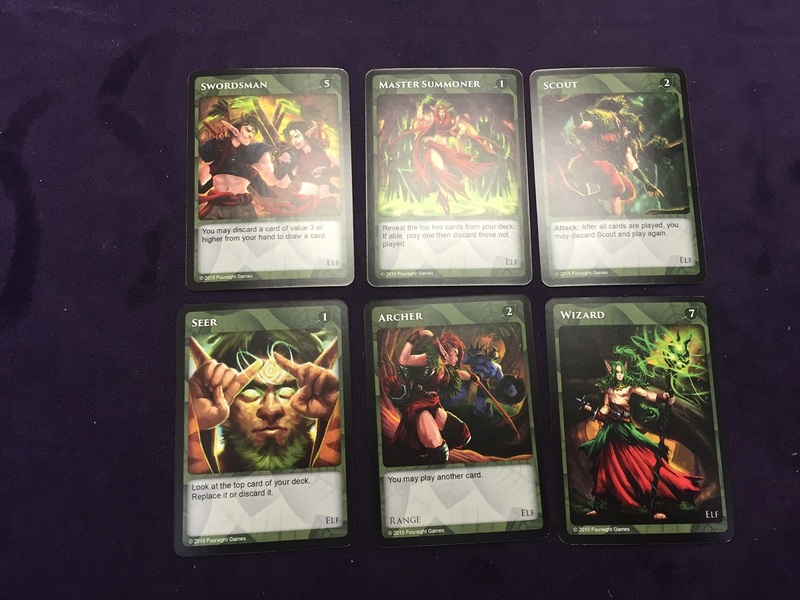 As such, they came up with Fate of Akalon: Tribes, their new card game that’s going up on Kickstarter soon. They sent me a prototype version of the game to test out. Much of the art wasn't done on the cards yet, and the box isn't what the final ones will like, but neither of those effect game play. And so I’m here now to give you my thoughts. The Great Storm has ravaged the lands of Akalon. Cities were razed. Forests were destroyed. Farmland was turned into a wasteland. This has uprooted all the various races that used to live in those territories and forced them to seek out new living spaces. Even the Dwarves in their mountains haven’t been left untouched by the Great Storm’s wrath. Obviously, though, not all the races are going to get along. And with so many trying to live in what’s left of the habitable spaces, tensions are bound to boil over and cause conflict. 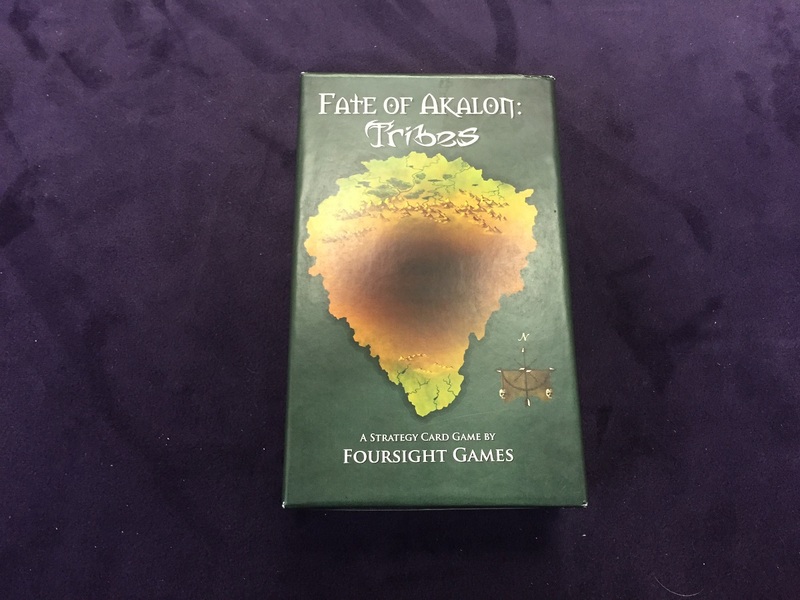 That’s the story behind Fate of Akalon: Tribes, a new card game from Foursight Games. 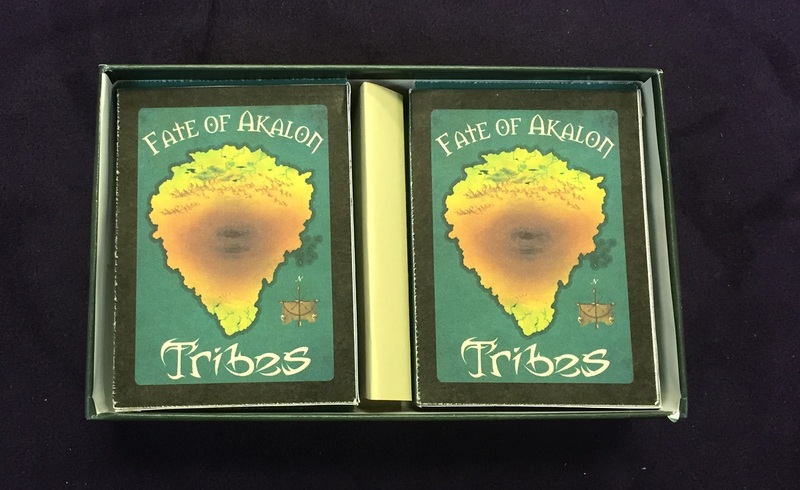 The card game is similar to War, the classic card game where you flip cards from a deck one at a time, with the higher player winning and getting the card that their opponent had played. Though Tribes adds a bunch more strategy and tactics to the mix. The game starts out with each player shuffling their deck of cards. My prototype came with four races: Elves, Orcs, Undead, and Dwarves. The decks have 28 cards in them. Each card has a number from 0 to 8 in the upper-right corner. That’s the combat value of the card. It’s used to determine the winner during Battles. It’s a rather simple “highest total wins.” But most cards also have a special ability on them. More on those in a bit. 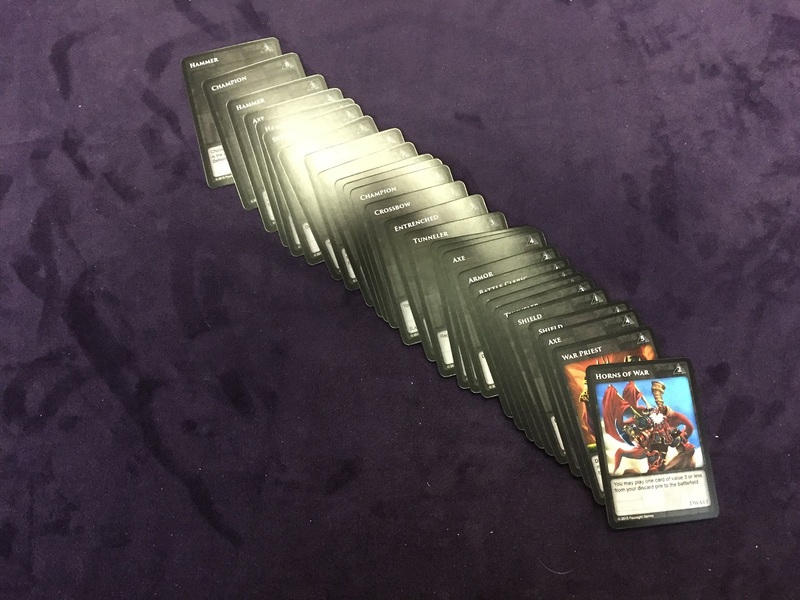 Anyway, after you’ve picked your faction and shuffled your deck, you and your opponent each flip over the top card of your deck. This is the opening Skirmish of the game to determine who will be the first Attacker. Look at the cards flipped and see who has the higher number. Any special abilities on the cards are ignore for the Skirmish. The player with the higher card puts theirs in their Discard pile. The player with the lower number puts their card in their Cemetery and gets to pick if they want to be Attacker or Defender in the first Battle. After choosing, players then each draw 5 cards and are ready to begin. A quick note on the two different piles mentioned above. You can think of the Discard pile as sort of a place where cards go to “rest” before getting shuffled back into the draw deck to be played again. Meanwhile, the Cemetery pile is a bit more permanent of a place for cards to end up. Sure, there are some cards that’ll bring things back from the Cemetery (particularly for the Undead deck), but for all intents and purposes, cards in the Cemetery won’t be coming back. That’s not to be confused with Out of Play, which is the “really, really gone” version of things. Out of Play is just that. It’s gone for good (well… until your next game, anyway). Now that we have our piles decided, let’s Battle. During a Battle, players play a card from their hand in an attempt to have the highest Combat Value total. The Attacker is the first player to play. They pick a card from their hand and set it face-up in front of them. This is where the Special Rules mentioned before come in. Almost every card has some sort of special rule on it. Some let you add more cards to the Battle. Others modify their Combat Value based on whether they’re Attacking or Defending. Still others let you Draw or Discard cards. They’re all rather unique and each Faction has certain things that their cards will generally be able to do. Orcs gain bonuses for Attacking. Dwarves are good at Defending. The Elves have a lot of draw/discard hand manipulation. Undead can bring cards back from the Cemetery. Anyway, the Attacker plays their card and does any Specials on their cards. The Defender then does the same. 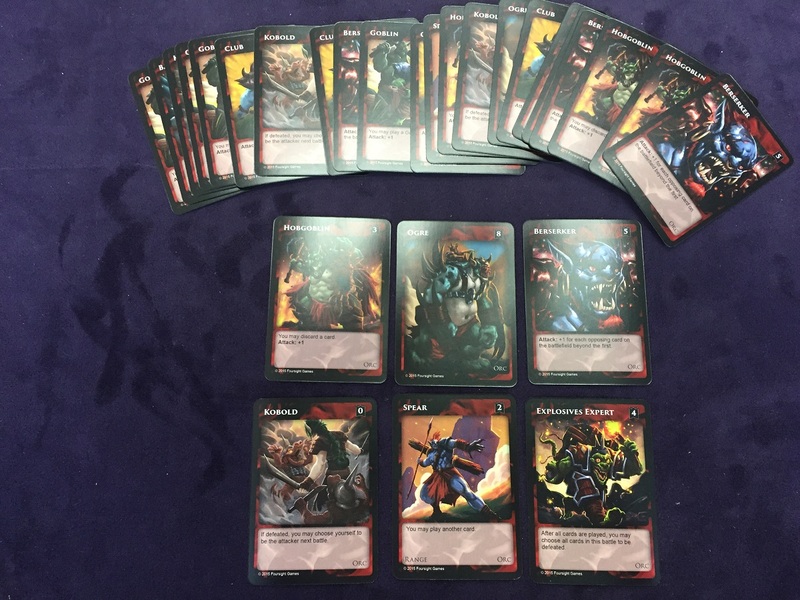 When all cards have been played for a Battle, the players compare Combat Value totals. The player with the higher total has won the Battle. Their cards go to the Discard pile. The losing player’s cards go to the Cemetery. In case of a Tie, everyone’s cards are sent to the Cemetery. The player that won the Battle will be the Attacker for the next round (in case of a tie, the same player will be the Attacker in the next battle). An interesting twist is drawing new cards to your hand. This only happens when you have no cards still in your hand. This means you will have to play every card you draw before you are able to draw again (and a place where the Elves’ ability to draw/discard comes in real handy… no pun intended). If you run out of cards in your Draw Pile, you shuffle your Discard Pile and create a new Draw Pile from it. Play also doesn’t end when one player is totally out of cards, like in War. Instead, keep track of the total Combat Value of all cards in both player’s Cemeteries. When one player’s total hits 30, the game is over. The player with the lower total is the winner (since both players can end up going over 30 at the same time). 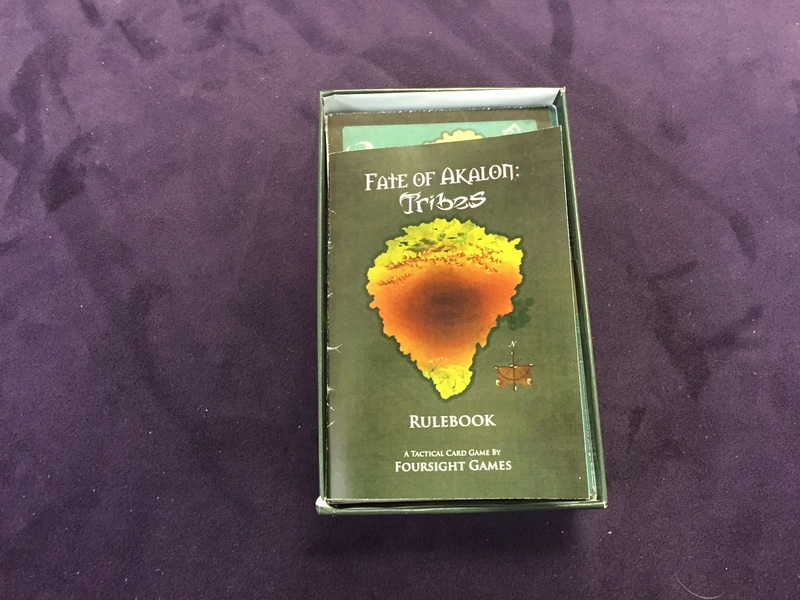 Fate of Akalon: Tribes is… surprisingly tactical. If you hear, “It’s like War, but not,” you might just sort of write the game off. But really, with the special rules on the cards, there’s some interesting choices you have to make. Part of it comes from having to use your entire hand before you can draw back up again. It seems like a little thing, but when you’re forced to play some sub-optimal cards because they’re what’s left in your hand, it can get rather interesting. And since both you and your opponent are doing the same thing, sometimes a card you throw out there to attack, expecting it to get trounced, ends up really coming through. And, of course, it fits the description of “quick game you can toss in your gaming backpack to play between other games” that I enjoy having around so much. A single game will take 10-15min to play (the box says 30. We didn’t have any last more than about 17). It’s very quick to teach someone to play, so you can get going right away. So check Tribes out. The Fate of Akalon is yours!